The Byron Metos collection consists of photographs taken by German soldiers, who served their military service in Greece during the German Occupation (1941-1944). Initially collected by an anonymous German soldier, the photographs were later purchased by the collector Byron Metos, who bought the part of the collection related to Greece. Aiming to reveal the power of propaganda, as reflected in both official and amateur photographic production of the Third Reich, the exhibition seeks to shed light on unknown aspects of the city’s history, as the German occupation is still an unexplored period. Featuring original photographs and film, reproductions and digital screenings, the exhibition seeks to reconsider photographs which, until recently, were dismissed as historical documents on the basis of their recording the “gaze of the German conquerors” but also of their being of amateur, and therefore of marginal character. In the frame of the exhibition an international conference will be held on April 8th 2016, which will explore aspects of the photographic production in occupied Thessaloniki. Both the catalog that accompanies the exhibition and the conference are realized with the support of the Consulate General of the Federal Republic of Germany in Thessaloniki (with the help of the Greek-German Fund for the Future) and of the Association of Friends of the Museum of Byzantine Culture. A music event will be held at the opening. Featuring: Nonna Kyriazopoulou (soprano), Alexandra Melachrinou (soprano), students at the State Conservatory of Thessaloniki (class of Eni Kini). On the piano the distinguished pianist and educator Ioanna Evang. Polyzoidou. 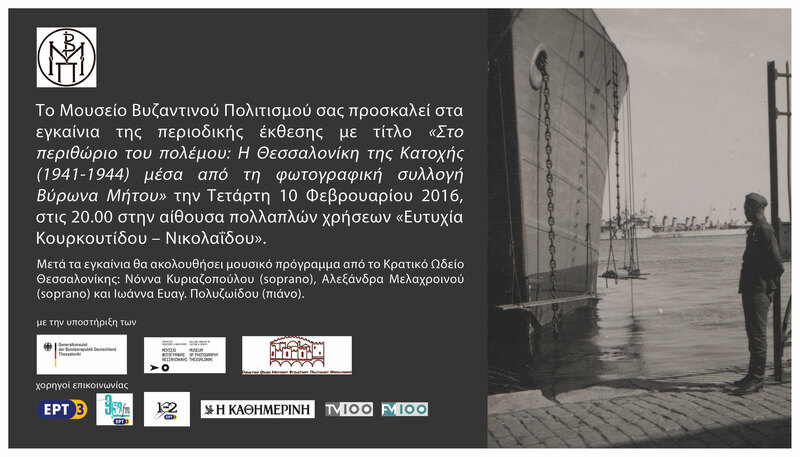 Collaborating institutions include the Thessaloniki Museum of Photography, the Science Center and Technology Museum “Noesis”, the Historical Archive of Greek Refugees of the Municipality of Kalamaria.